This article is about the British-born musician. For the English footballer, see Simon Collins (footballer). 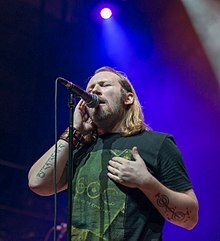 Simon Philip Nando Collins (born 14 September 1976) is a British-Canadian musician, drummer and lead vocalist of the progressive rock band Sound of Contact. Collins is the son of English drummer and singer Phil Collins and Collins' first wife, Andrea Bertorelli. He is the brother of actress Joely Collins and half-brother of actress Lily Collins. Reviewers have compared his vocals to his father's. Collins was born in Hammersmith, London, England on 14 September 1976, the eldest son of English drummer, singer-songwriter Phil Collins and his first wife, English-Canadian citizen Andrea Bertorelli. He moved to Vancouver, British Columbia in 1984, when he was eight years old, after his parents' divorce. He lived with his mother, Andrea, and sister, Joely, in nearby Richmond between the ages of 8 and 11. In September 1987, they moved into an estate purchased in Vancouver's Shaughnessy neighbourhood with assistance from their father, a decision described by Andrea Collins as a means to a better education for Collins and his sister and for the sake of other lifestyle considerations. In 1991, Simon's parents were involved in a court battle at the Supreme Court of British Columbia to gain possession of the estate, owing to a misunderstanding of the terms of ownership of the home. Their father had previously placed the estate in an irrevocable land trust in 1987, however, to be owned by both children jointly in adulthood. Their father succeeded in retaining control of the estate until Simon's twentieth birthday, as the judge ruled in October 1991 he was not old enough to sign his half of the estate to his mother as she had intended. Collins completed his secondary education at Vancouver's Point Grey Secondary School. He first became involved with music when he was five after his father purchased for him a Tama drum kit. Collins practised drumming by playing along with music albums in his parents' record collection as well as when accompanying his father while on tour with Genesis. Collins' experiences on tour allowed him to be mentored by his father and by the band's touring drummer, Chester Thompson. Though he had a percussion instructor when he was ten, Collins preferred drumming to artists such as Stewart Copeland, Gavin Harrison, and Keith Moon over his formal lessons in jazz drumming. Simon made his first onstage appearance alongside his father at the age of 12, performing drums on "Easy Lover." He also appeared onstage for a performance during the Seriously, Live! World Tour. In his early teens, Collins learned to play the piano and began to develop songwriting and singing skills. While he played drums in numerous hard rock bands beginning at age 14, Collins wanted to pursue singing, songwriting, and diversity in music styles, including pop, progressive rock, rock and roll, punk, grunge, and electronica. According to Collins, he did not wish to spend his life "drumming to other people's music." His early compositions were rejected by the heavier rock bands he played for because of their pop style. In his late teens, Collins worked part-time as a disc jockey in Vancouver's rave scene. His experiences in rave culture inspired a collaborative documentary project with his sister Joely called Summer Love. Collins developed a passion for astronomy and social issues during his youth, and frequently revisits these themes in his music. Prior to the beginning of his solo career, Collins was a member of the local punk band Jet Set. Collins was signed by Warner Music following a release of demo tapes he had recorded in 2000. It was at this time that Collins moved from Vancouver to Frankfurt, Germany, where his debut album All of Who You Are was released. The album saw 100,000 copies sold in Germany and three singles were released off it: "Pride", "Money Maker" and "Shine Through". The album's sales have been attributed to the success of the single, "Pride." A second single, "Shine Through", was co-written by Collins and Howard Jones. In 2003, Collins left Warner Music and returned to Vancouver to start his own record label, Lightyears Music. On the Lightyears label two years later, Collins released his second album, Time for Truth. He played a variety of instruments on the album in addition to providing the majority of the vocals. In 2007, he recorded a cover of Genesis' Abacab track "Keep It Dark," as a tribute to Genesis, with keyboardist and co-producer Dave Kerzner. During production of "Keep it Dark", Collins met Kevin Churko, who mixed and mastered the recording; Collins later had Churko work with him on the production of his third album, U-Catastrophe. U-Catastrophe, released in 2008 on iTunes, became Collins' first North American recording project. The album's first single, "Unconditional", debuted on the Billboard Hot Adult Contemporary Tracks chart at No. 30 in September 2008. It later peaked at No. 12 on Billboard in November 2008 and charted on the Canadian Hot 100 in the same month. Kerzner, Kelly Nordstrom, and Steve Hackett were featured on "Fast Forward the Future"; Phil Collins appeared on "The Big Bang". In late 2009, Collins approached Kerzner with the idea of forming a new band. After bringing the idea to musicians Matt Dorsey and Kelly Nordstrom, the four of them began working together at Greenhouse Studios in Vancouver. The band, known by December 2012 as Sound of Contact, included Collins on lead vocals and drums, Kerzner on keyboards, Dorsey on bass, and Nordstrom on guitar. The band's debut album, Dimensionaut, was released in May 2013. Soon after the release of Dimensionaut, Nordstrom left the band; Kerzner left in January 2014. Both rejoined the group in April 2015 and, subsequently, Sound of Contact began working on their second album. ^ a b c Collins Estate , CanLII 398 (BCSC 1991). ^ Gee, Dana (4 May 1999). "Playing to their own beats: Phil Collins' kids are making their own marks in life: [Final Edition]". The Province. While Simon has stepped smack-dab into dad's footsteps, his older sister Joely has chosen acting, a path her mother Andrea followed when she was younger. ^ "The Pleasure List: Lily fits new role to a tutu". Irish Independent. 5 January 2014. Retrieved 19 May 2014. ^ The Toledo Blade. Tharp, Bridget. "Sounds: Simon Collins forges his own musical identity". 16 August 2008. Retrieved 29 April 2013. ^ a b Simon Collins Follows His Father Phil Into the Pop Charts. Archived 12 May 2013 at the Wayback Machine About.com. Retrieved 29 April 2013. ^ Gold, Kerry (10 June 2000). "Genesis of a music dynasty: Not Daddy's boy: Simon Collins is determined to make his own name in pop music, despite the baggage of being Phil's son. : [Final Edition]". The Vancouver Sun. Collins is 23 and he bears a vague resemblance to his father. Vocally, however, the resemblance is more striking." "The airy vocals may be nearly identical, but Collins marries his soft, pop melodies with a light groove and plastic '80s synth beat to create an impressive display of electronica ultra-light. ^ Gold, Kerry (10 June 2000). "Genesis of a music dynasty: Not Daddy's boy: Simon Collins is determined to make his own name in pop music, despite the baggage of being Phil's son. : [Final Edition]". The Vancouver Sun. Collins, who moved here from London, England with his mother when he was eight, has been far more influenced by the punk revival and the grunge explosion than by his father's solo music. ^ Quan, Douglas (2 June 2000). "Simon Collins struggles to be more than 'son of Phil': Vancouver- raised musician releases debut CD of 'Euro-space-pop': [Final Edition]". The Ottawa Citizen. Born in London, he moved to Vancouver at the age of eight, where he grew up with Phil Collins' first wife, Andrea. ^ a b c d e f g h Bio | Simon Collins Official Website. SimonCollins.com. Retrieved 21 July 2013. ^ Edge, Marc (23 October 1991). "Phil Collins wins fight over house: B.C. Supreme Court decides against ex-wife: [1* Edition]". The Province. 'Ms. Collins wished to move to Vancouver as she had concern as to the quality of schooling in Richmond and 'other lifestyle considerations,' ' noted B.C. Supreme Court Justice Ronald Holmes. ^ Ahearn, Victoria (19 October 2005). "Simon Collins has no time to 'Phil': Rocker too busy to play with dad on latest tour: [Final Edition]". Prince George Citizen. He was born in London but moved to Vancouver when he was eight with his sister, Gemini-winning actress Joely, and mother Andrea, his father's first wife. ^ Edge, Marc (23 October 1991). "Phil Collins wins fight over house: B.C. Supreme Court decides against ex-wife: [1* Edition]". The Province. Pop singer Phil Collins won a court fight yesterday to keep the high-priced Shaughnessy house he bought for his two children out of the hands of his ex-wife. The British rocker bought the Vancouver home for his son and daughter in 1987 after ex-wife Andrea complained about living in Richmond. ^ Edge, Marc (23 October 1991). "Phil Collins wins fight over house: B.C. Supreme Court decides against ex-wife: [1* Edition]". The Province. The singer placed the property in trust in 1987 for his son Simon, then 11, and daughter Joely, then 15, who were to own the home jointly when they reached adulthood. 'Ms. Collins was apparently under the impression during the course of the property acquisition that she would be sharing in the ownership,' said Holmes. But when it became clear she was left out of the deal, she convinced her kids to sign the property over to her." "The judge said Simon, now 15, will have to wait four more years if he wants to sign his half of the home over. 'The decision to give up as substantial an asset as his interest in this trust is one to be reserved until he reaches the age of majority,' said the judge. ^ "Phil Collins's manic mansion: ONT Edition". Toronto Star. 24 October 1991. He put the title in an irrevocable trust, which the children will share when his 15-year- old son Simon is 20. ^ Quan, Douglas (2 June 2000). "Simon Collins struggles to be more than 'son of Phil': Vancouver- raised musician releases debut CD of 'Euro-space-pop': [Final Edition]". The Ottawa Citizen. He attended Point Grey Secondary School in Vancouver with his older sister, Joely. ^ Gee, Dana (4 May 1999). "Playing to their own beats: Phil Collins' kids are making their own marks in life: [Final Edition]". The Province. When most kids were banging on pots and pans with wooden spoons, five-year-old Simon Collins was working out rhythms on a miniature drum kit, a gift from his pop star dad Phil Collins. ^ Ahearn, Victoria (19 October 2005). "Simon Collins has no time to 'Phil': Rocker too busy to play with dad on latest tour: [Final Edition]". Prince George Citizen. Like his father, he learned his drumming skills at the age of five and could pound out songs with his dad and the Genesis crew quite early in life. ^ a b c d Sound of Contact Progressive Rock Band Interview | Audioholics. Audioholics. Retrieved 21 July 2013. ^ Simon Collins. Modern Drummer. Retrieved 21 July 2013. ^ a b Ahearn, Victoria (19 October 2005). "Simon Collins has no time to 'Phil': Rocker too busy to play with dad on latest tour: [Final Edition]". Prince George Citizen. 'I've played drums for him onstage many times; the first time when I was 12 and I did Easy Lover, and on the But Seriously tour (in 1990), that was really cool. ^ a b Simon Collins Biography. MapleMusic. Retrieved 21 July 2013. ^ Quan, Douglas (2 June 2000). "Simon Collins struggles to be more than 'son of Phil': Vancouver- raised musician releases debut CD of 'Euro-space-pop': [Final Edition]". The Ottawa Citizen. In his mid-teens, Mr. Collins began drumming with bands in Vancouver." "Even Mr. Collins won't deny the influences his father's band, Genesis, has had on his music. 'My influences from very early on would be Genesis – quelle surprise. ^ Gold, Kerry (10 June 2000). "Genesis of a music dynasty: Not Daddy's boy: Simon Collins is determined to make his own name in pop music, despite the baggage of being Phil's son. : [Final Edition]". The Vancouver Sun. Collins, who moved here from London, England with his mother when he was eight, has been far more influenced by the punk revival and the grunge explosion than by his father's solo music." "'I've always been influenced by punk and electronic stuff, so it was a natural progression.' Simon has been surrounded by electronic music influences, including the DJ music at the Summer Love raves his sister Joely has produced and his own DJ gigs." ""I'm writing with guitar now, so a lot of my rock 'n' roll, Oasis, punk influences are coming out," he considers. ^ Gold, Kerry (10 June 2000). "Genesis of a music dynasty: Not Daddy's boy: Simon Collins is determined to make his own name in pop music, despite the baggage of being Phil's son. : [Final Edition]". The Vancouver Sun. I didn't want to spend my life drumming to other people's music," says Collins, who'd been playing with bands since he was 14 and had written a catalogue of pop songs. ^ Quan, Douglas (2 June 2000). "Simon Collins struggles to be more than 'son of Phil': Vancouver- raised musician releases debut CD of 'Euro-space-pop': [Final Edition]". The Ottawa Citizen. In recent years, Mr. Collins made a name for himself in Vancouver's rave scene, working part-time as a DJ. ^ Quan, Douglas (2 June 2000). "Simon Collins struggles to be more than 'son of Phil': Vancouver- raised musician releases debut CD of 'Euro-space-pop': [Final Edition]". The Ottawa Citizen. Last year, he collaborated with his sister on a documentary about raves called Summer Love. ^ Ahearn, Victoria (19 October 2005). "Simon Collins has no time to 'Phil': Rocker too busy to play with dad on latest tour: [Final Edition]". Prince George Citizen. He was born in London but moved to Vancouver when he was eight with his sister, Gemini-winning actress Joely, and mother Andrea, his father's first wife. It was there that Collins developed a passion for astronomy and social issues – themes that dominate his website, lyrics and liner notes for Time For Truth. ^ Gold, Kerry (10 June 2000). "Genesis of a music dynasty: Not Daddy's boy: Simon Collins is determined to make his own name in pop music, despite the baggage of being Phil's son. : [Final Edition]". The Vancouver Sun. Before he began his solo career, Collins played drums (like dad) for Vancouver punk band Jet Set. ^ Ahearn, Victoria (19 October 2005). "Simon Collins has no time to 'Phil': Rocker too busy to play with dad on latest tour: [Final Edition]". Prince George Citizen. Collins, 29, recently moved from Germany to Vancouver, where he grew up, to promote his second album, Time For Truth. ^ Simon Collins discography Discogs.com. Retrieved 5 June 2009. ^ a b The Brooks Bulletin. Brown, Rob. "Canadian Simon Collins releases first US album". n.d. Retrieved 22 July 2013. ^ Howard Jones Official Website, "The complete lyrical index of Howard's music"
^ Gold, Kerry (10 June 2000). "Genesis of a music dynasty: Not Daddy's boy: Simon Collins is determined to make his own name in pop music, despite the baggage of being Phil's son. : [Final Edition]". The Vancouver Sun. And although Phil had produced Jones in the '80s, Collins recruited the former new waver on his own. ^ Ahearn, Victoria (19 October 2005). "Simon Collins has no time to 'Phil': Rocker too busy to play with dad on latest tour: [Final Edition]". Prince George Citizen. The 'psychedelic trance'-loving artist sings and performs all the synth-heavy instrumentals on the record and released it on his own label, Light Years Music in Vancouver. ^ a b Simon Collins, U-Catastrophe credits. Allmusic. Retrieved 29 April 2013. ^ Simon Collins | Awards | AllMusic AllMusic. Retrieved 21 July 2013. ^ a b Sound of Contact biography. Archived 25 June 2013 at the Wayback Machine Sound of Contact. Retrieved 29 April 2013. ^ Sound Of Contact: announces departure of keyboard player Dave Kerzner. InsideOut Music. Retrieved 9 January 2014. ^ Dave Kerzner and Kelly Nordstrom Back In Sound Of Contact. Prog Magazine. Retrieved 22 April 2015. ^ "Simon Collins Album & Song Chart History". Retrieved 6 May 2015. ^ "Officialcharts.de – Simon Collins – Pride". GfK Entertainment. Retrieved 6 May 2015. ^ "Officialcharts.de – Simon Collins – Shine Through". GfK Entertainment. Retrieved 6 May 2015.